Part B of Schedule 4 to the Constitution lists air quality services as a local government matter to the extent set out in section 155 (6) (a) and (7). The Bill of Rights provides that everyone has the right to an environment that is not harmful to their health or well-being. The objectives of the National Environmental Management Act AQA, (Act 39 of 2004) are to protect the environment by providing reasonable measures to protect air quality and to prevent air pollution and to give effect to Section 24 (b) of the Constitution. The AQA promotes a holistic approach to an air quality management system while the air quality management system provides a framework for managing air quality while an AQMP applies this theory in an operational manner. An AQMP is but one component of the overall Air Quality Management System. The Garden Route District Municipality is also the licensing authority for listed activities in the Garden Route region in terms of the National: Environmental: Air Quality Act, 2004 (Act 39 of 2004). Notwithstanding limitations, GRDM has succeeded in substantially meeting the diverse tasks and duties associated with air quality management and defined in the AQMP compiled during 2013. The AQMP is currently due for renewal. The Air Quality Management Unit aims to minimise the impact of air pollutant emmissions on the population and the natural environment of the Garden Route District. The following functions can only be done by Districts and Metropolitan municipalities: All aspects of Atmospheric Emission Licensing for Listed Activities, monitoring illegal listed activities, controlled emitters and monitoring compliance with AEL- conditions. 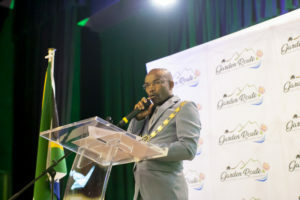 The Garden Route District Municipality (GRDM) will pursue the vision and mission of the AQMP through a series of nine objectives, each aimed at enhancing the EDM’s role as manager of air quality in the region. Ambient Air Quality monitoring- In-stack, continuous ambient monitoring, passive sampling.